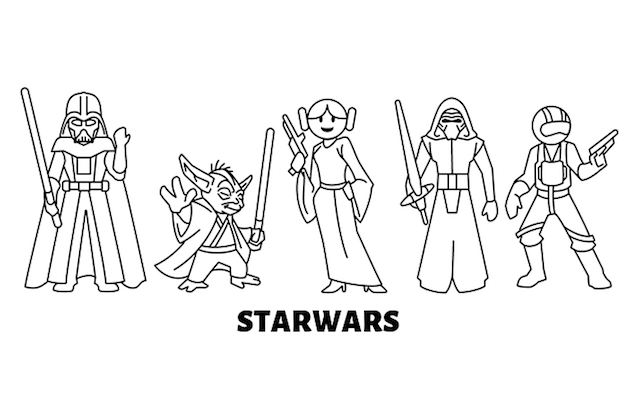 To start our blog Star Wars stickers today, we would like to make a short summary of the successful Star Wars movies. Star Wars, Episode IV – A New Hope is a 1977 American epic space film written and directed by George Lucas. It is the first film in the original Star Wars trilogy starring e.g. Harrison Ford, Carrie Fisher, Alec Guinness and Mark Hamill. The film is about a Rebel Alliance, led by Princess Leia (Fisher), and its attempt to destroy the Galactic Empire space station, the Death Star. The farm boy Luke Skywalker (Hamill), inadvertently acquires two droids that possess stolen architectural plans for the Death Star. When the Empire search for the missing droids, Skywalker accompanies Jedi Master Obi-Wan Kenobi (Guinness) on a mission to return the plans to the Rebel Alliance and rescue Leia from her imprisonment by the Empire. A New Hope was followed by the successful sequels The Empire Strikes Back (1980) and Return of the Jedi (1983); these three films constitute the original Star Wars trilogy. A second trilogy was released between 1999 and 2005, which received mixed reactions from the fans. A third trilogy began in 2015 with the release of Star Wars: The Force Awakens. The first seven films were nominated for Academy Awards (with wins going to the first two films released) and have been commercial successes, with a combined box office revenue of over US$8.5 billion, making Star Wars the second highest grossing film series. In 2012, Walt Disney bought Lucasfilm for US$4.06 billion and earned the distribution rights to all subsequent Star Wars films, beginning with the release of The Force Awakens in 2015. The former distributor, 20th Century Fox, was to retain the physical distribution rights for the first two Star Wars trilogies, was to own permanent rights for the original 1977 film and was to continue to hold the rights for the prequel trilogy and the first two sequels to A New Hope until May 2020. On December 14, 2017, the Walt Disney Company announced its pending acquisition of 21st Century Fox, including the film studio and all distribution rights. Originalpeople has just released Star Wars stickers . If you want to design your own customizable Star Wars sticker, go to www.originalpeople.com and choose the figures you like most and write a text. The decals will make a great gift, or you can decorate your car, mail box, laptop, window or any hard surface. The stickers will serve as a great Star Wars memory for you and your loved ones. Make your dog become a real travel companion! A new way to support a beautiful cause !